In opening the first Jaguar Land Rover Classic facility in the US, the first of its kind, JLR is cleverly taking steps to preserve its heritage with the cars already in the wild. By expanding the restoration market by offering electrification and restoration options, it also takes steps not only to help clean the environment, but also cleverly erase the mechanical troubles its cars have been known for, for decades. 75 jobs starting at $80,000 each will be employed there according to WSB-TV 2 in Georgia. A 42 bay workshop will work on JLR vehicles 10 years old and older. OEM parts and service will be offered for these cars only. Contrary to prior interpretations of JLR announcements, they are not going all electric like Volvo. Starting 2020 every model will have an electric option. Jaguar E-Type Zero comes from the Jaguar Reborne Program. 170 mi range from 40 kW battery pack that takes 6-7 hours to recharge. Updated electrical LED infotainment screen all the 21st century features. Once upon a time not long ago in the auto industry there was a definitive line between OEM and after market. Both were separate industries and once your car passed its new car warranty, then another world opened up for you, but there was always no turning back. But the advent of electric cars changing the car dealer model of profitability that was abundant with gas cars that will no longer be the case with electrics, as there’s less to repair with an EV,seems to be changing all of that. Enter the Jaguar and Range Rover Classic Lines. In Spanish, a man’s car is metaphorically referred to as “the [other] mistress.” Some may say these are “the Stepford Wives” of the Car Industry. 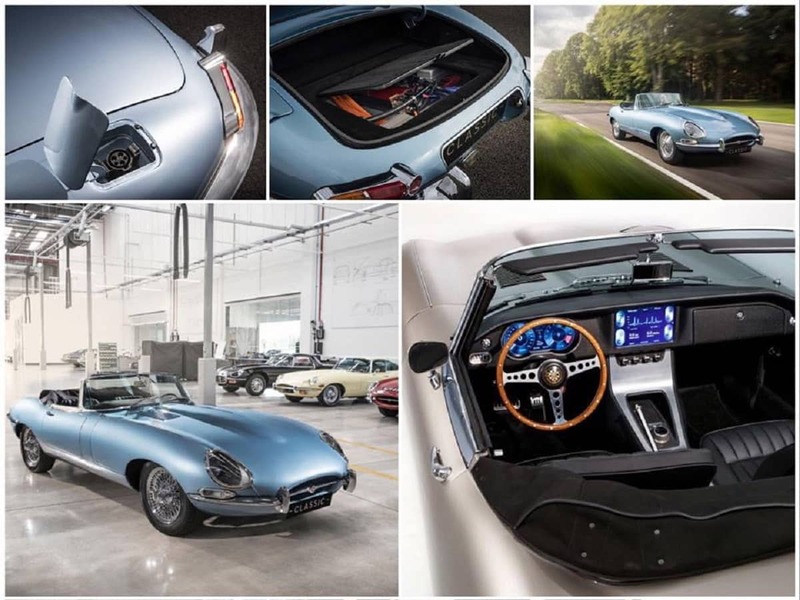 Jaguar Land Rover is reintroducing the iconic storied Jaguar E-Type sports car of the 1960s to its lineup in what will be a Classic Edition to its current model range, called E-Type Zero. Not only will Jaguar customers be able to buy a like-new E-Type the way it was made 50 years ago with today’s safety and efficient technologies, but with its new facility in Georgia any US retailer will be able to quote you a restoration and an electrical conversion price on a current existing non-restored E-Type to have it remade and electrified. This program stems for the Jaguar Reborne Program. It is amazing what happens when one takes a classic car known for its characteristic as a gasoline version, to convert into an electric car, for it to come out on the other side of electrification as if the car is all new and totally different as if it were never made they way it originally was, according to history. All the leaky Jaguars, the Range Rovers with engine problems with the different power trains they tried over the years, some even American built or designed to constant failure, the temperamental Maseratis and Ferraris and Lamborghinis, constantly in the shop. The $2,100 Bentley or even yet, the $21,000 Bugatti scheduled service will no longer be needed to wonder what else could the bespokes charge their electric customers for? It seems all those problems disappear like they did for husbands of the Stepford Wives, in this case for the Automotive World for their cars, once they get converted and plugged in. We can only imagine if a driverless robot conversion kit is soon to follow. Wives: I’d start to get scared of your husbands if they get conversion crazy if I were you. What JLR is doing should actually be applauded and all the historical legacy classic heritage brands like Rolls Royce, Bentley, Cadillac, Lincoln, Chevrolet, Maserati, Alfa, etc should be doing the same with their brands. Premium brand Mazda has even joined the restoration bandwagon by buying up and restoring Classic Miatas to put them back out in the wild, although nothing mentioned of electrification. Mini Cooper is doing exactly that with their so far proposed Mini Classic lines, Minis that look like the old post war tiny micro classic cars they duplicate, but in this case were purposed made for electrification and look retro. Mini has as of date no plans to put those into production. And of course they’re the tuner shops all over the country, this Long Island one converting an Audi from sacrificed Tesla guts. Chevrolet should be offering the same not just with their brand, but tipping their hat to honor Pontiac vehicles as well, taking care of all those Trans Ams and GTOs and Tempests with their Camaro, Nova, Chevelle, and El Camino sisters. If Corvette goes on their own way as a brand with C7 and C8 they should take the whole Corvette family with them, Cadillac XLR too, their neglected step sister, poor thing. Buick should take care of themselves and departed sister Oldsmobile. The bespokes should be working on logistics if their brand is an acquisition like Rolls and Bentleys are to the Germans, to hammer out between the two who restores and tricks out what Derby or Crewe car in what years in a brand certified boutique restoration and electrical conversion tuner shop to dole out the work: it’s for the same cause and all the brands profit. By opening these boutique restoration and electrification tuner depots, the premium, luxury, performance, and bespoke brands accomplish several things. They enhance the prestige and value to the brand name by seeing more well maintained and cared for examples in the wild that when resold fetch a higher resale price. Seeing more electrified Classic Jags Rovers Rolls Mustangs Benzes BMWs ‘Vettes etc. will encourage others to jump on either the new EV or classic conversion EV bandwagon. And yes it doesn’t have to be exclusively about EVs although that’s what will probably happen but at least not yet. Obviously resale value not just for the current lineups but also for the legacy models are both enhanced. By doing this car makers find other ways for their dealers and retailers to make profits since the current model for electric cars not making much money in dealer repairs is going to hit car retailers hard. The legacies have something that’ll take companies like Tesla a long time to accomplish: having a legacy. The older ones should take advantage of it. By investing in these kinds of shops for their older cars there’s money to be made. What do you think of the Jaguar Land Rover Classic Series and Classic Car Conversions? Let us know below!